But, just as in Mexico City last year, Hamilton did enough to win the championship, his fourth in five quite remarkable years. Ferrari's Vettel finished second. "It's a very strange feeling right now," Hamilton said as he got out of his car and celebrated. "I have been at Mercedes since I was 13 so to complete the title, and Fangio won two championships with Mercedes, is an incredible feeling. It feels very surreal." Hamilton also paid tribute to his dad, Anthony, and the rest of his family, adding: "To my family back home, I love you, and I wouldn't be here if it wasn't for all the hard work that my father did. It is a great moment." 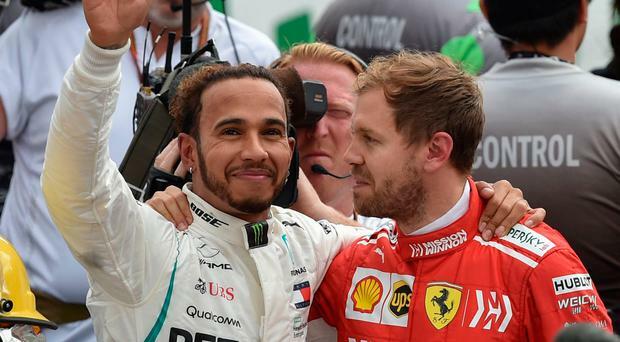 With the championship on his mind, and the opening three corners the biggest threat to his historic quest, a cautious Hamilton took no risks, decelerating faster than Verstappen, and who could blame him? Hamilton slotted in behind the Dutchman, with pole-sitter Ricciardo dropping to third. Behind, Vettel, knowing that he had to win to stand any chance of stopping Hamilton, he held off a fast-starting Valtteri Bottas, the pair even banging wheels at Turn 3, both escaping without damage. For Hamilton, second would comfortably be enough, but the man who had shown no signs of strain - despite carrying the weight of history on his shoulders - was soon complaining about his fragile tyres. Then, he snapped at his race engineer, Pete Bonnington, telling him to leave him to it. It would become a theme of the race but he kept his cool to make history. Hamilton added: "I don't allow myself to be too emotional in public, but now I feel humbled by the whole experience it's hard to realise it at the moment. It's something I dreamed of, but I never in a million years thought I'd be stood here as a five-time champion and I'm so grateful for everyone who helped me be here, to raise the bar and lift the cup and I couldn't have done it with out them, and especially for my dad who truly believed we had it, all those years ago. "It was a goal, when I won the championship last year I kept thinking how can I be fitter, faster better, a better all-rounder; a better friend, better son, and I think I've been able to lift them all up this year. Maybe it comes with age or experience but I'm very happy with how it's gone. "It's hard to register that I've won. I remember when I won in F3, it didn't register. I hope this kicks in soon, I feel more excited the more I think about it." FIA Formula 1 Mexican Grand Prix, Autodromo Hermanos Rodriguez, Mexico City. 1:38:28.851, 2 Sebastian Vettel (Ger) Ferrari 1:38:46.167, 3 Kimi Raikkonen (Fin) Ferrari 1:39:18.765, 4 Lewis Hamilton (Gbr) Mercedes GP 1:39:47.589, 5 Valtteri Bottas (Fin) Mercedes GP at 1 Lap. Drivers: 1 Lewis Hamilton (Gbr) Mercedes GP 358pts, 2 Sebastian Vettel (Ger) Ferrari 294, 3 Kimi Raikkonen (Fin) Ferrari 236, 4 Valtteri Bottas (Fin) Mercedes GP 227, 5 Max Verstappen (Ned) Red Bull 216. Manufacturers: 1 Mercedes GP 585pts, 2 Ferrari 530, 3 Red Bull 362, 4 Renault 114, 5 Haas F1 84, 6 McLaren 62, 8 Force India 47, 9 Sauber-Ferrari 36, 10 Scuderia Toro Rosso 33, 11 Williams 7.